Ricky is a gifted artist and major talent - and just 22. Spray cans is his 'thing'. Creating inspired, innovative and thoughtful graffiti art just like Banksy, is Ricky's passion, his love and his breathing world. His commissions are as diverse as his T-shirts and hip-hop way of talking. He is light-years ahead of other 22-year-old graffiti artists and is currently achieving critical acclaim amongst not only his peers, but the art world he inhabits. His sights are firmly set on much higher things in the artistic (Graffiti) world. In the not too distant future, he will without a shadow-of-a-doubt be compared to the likes of Banksy, Blek le Rat and other Graffiti artists. Ricky can create for you a personal, unique, one-of-a-kind graffiti art creation - satirical, political, whimsical, a social statement or art just for fun. He can spray paint a wall, a prepared Board or canvas - in fact he can spray paint on almost anything (within reason). This work of art is yours to keep, cherish or even store in a bank vault (for a rainy day in years to come). Inspired by local and great spray artists such as Blek le Rat, 3D and others, around 10 years ago at the age of 12 he (like many tear-aways of that age with a spray can in hand) got on the wrong side of the Law. Times have changed and those days are long gone. Ricky has been recognized in Leicester (his home town) as a rising talent to watch. He has created many wonderful community project murals and statements for both Leicester Town Council, the Police (YES, the Police - how times have changed) and youth Centres as well as dozens of private commissions. Recently he has branched out using his talents to create beautiful, stunning and creative designs for kids bedrooms! We were amazed too when we heard this... Cartoon characters are brought to life in vibrant colours and creative designs. This came about literally from a recent commission which, as things do, led from one thing to another - and ended up in the bedroom (metaphorically)! His talent for 'copying' accurately as well as injecting humour and artistic license has catapulted him to a higher level of commercial Art. Why Have a Graffiti Artist? There are dozens of reasons why to commission Ricky. Whom else of your friends or colleagues has had this? The hourly rate will be £25.00 per hour, with a minimum of two hours. 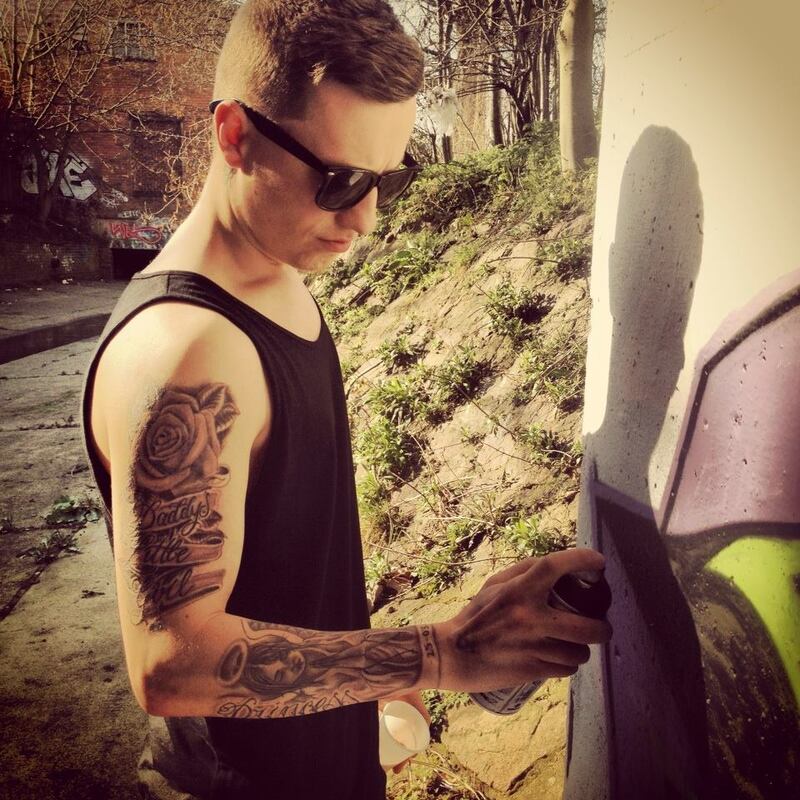 All materials (number of spray cans, colours) will be specified by Ricky and will be for the account of yourself. The wall, board or matetrial to be used for the Artwork may need preparation. This may be an extra cost for materials. Ricky is based Leicester. Unfortunately he does not drive. Commissions outside Leicester anywhere in the UK is possible, however transport will need to be provided (train fare/pick-up). Due to artistic commitments during the week, Ricky can only make appearances during weekends. However, if the piece is to be created on a Board, Canvas or some other medium that is, not on a wall, this may be created prior to the event/function in Leicester in his workshop and transported to the venue. If you are interested in owning something unique and different for your party, event or function (Corporate or private) - CONTACT us today.